MIAMI COUNTY — The same day her slain grandfather was laid to rest, Hope Earnshaw-York, 24, of Tipp City, appeared in Miami County Municipal Court to waive her right to a preliminary hearing. 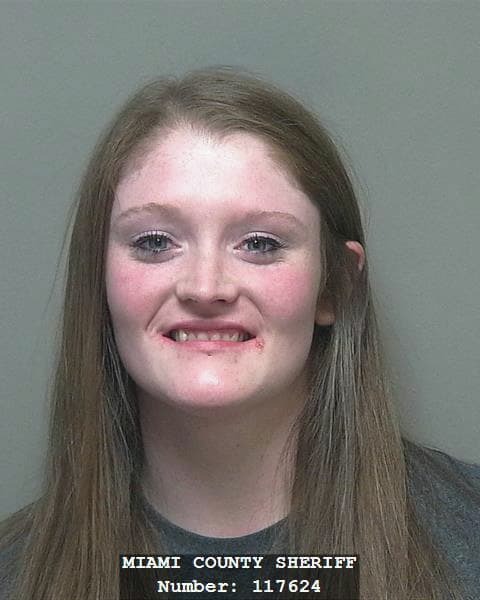 The preliminary hearing on Tuesday was for three counts of fourth-degree felony receiving stolen property in connection with the theft and sale of her grandfather William York Sr.’s guns in May. Appearing before Miami County Municipal Court Judge Elizabeth Gutmann, York, who is in her last trimester of pregnancy, quietly uttered, “Yes,” and nodded her head during the proceedings. The case will be bound over to the Miami County Common Pleas Court for grand jury consideration. Her bond continues to be held at $160,000 and she remains incarcerated in the Miami County Jail. Last week, Tipp City Police Department released the cause of death of William York Sr., 88, of Tipp City, as blunt-force trauma to the head. York’s remains were found in a sleeping bag in Gunpowder Creek in Union, Ky., on June 3. Court records implicate York’s granddaughter, Earnshaw-York, and her boyfriend, 35-year-old Richard Terrel. Neither one has been charged with a crime related to William York Sr.’s homicide as of press time. Last week, Terrel was arraigned on charges of fourth-degree felony receiving stolen property and fifth-degree felony theft for the theft and sale of guns belonging to York, which was reported in May. According to public records, the guns were sold to Olde English Gun Shop in Tipp City. Terrel also waived his right to a preliminary hearing and the case was bound over to the Miami County Common Pleas courts. His bond was continued for $150,000. In the months before his death, York contacted Tipp City Police twice about items he believed were stolen from his home. In February, York alerted police to the possible theft of papers from his home. He stated that the missing papers contained notes referencing the creation of a will. On June 4, Tipp City Police Department confirmed that the body found in a northern Kentucky creek was that of York, who was reported missing from his Evanston Road home on May 30. Terrel was jailed on June 3 for fifth-degree felony complicity to receiving stolen property belonging to York. The documents further allege that Earnshaw-York was in possession of checks and ATM cards belonging to her grandfather. According to court documents, Earnshaw-York had been staying with her grandfather for several months with her 3-year-old son, along with Terrel. Relatives stated Earnshaw-York said she was in Kentucky with Terrel, and she was also in possession of York’s truck, a silver Chevrolet Silverado, which was later recovered in Butler Township when the two were arrested at a motel.